I love the arrangement in the silver trophy on my stair parlor table. 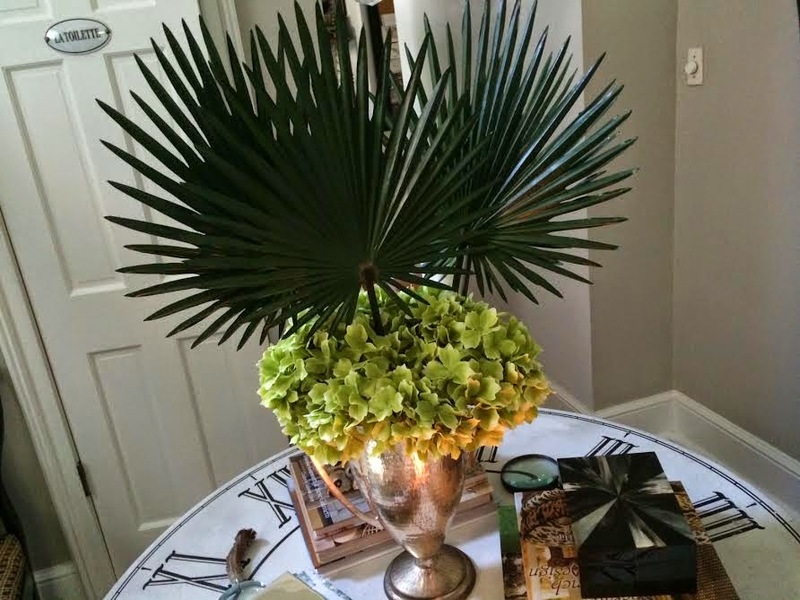 The arrangement is composed of high quality silks, hydrangeas and palmetto leaves. 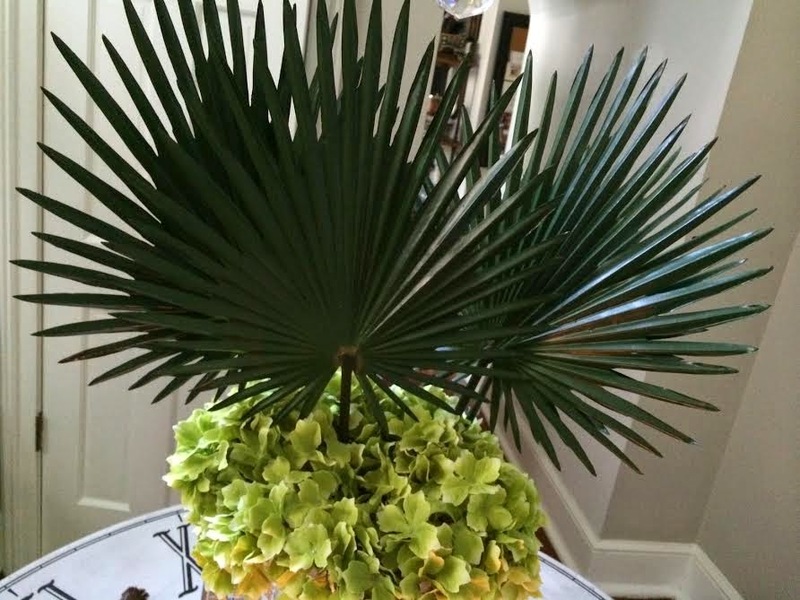 Both palmetto leaves and hydrangeas represent the Southern climate and way of life. I also like the combination of greens as bringing the outside in has always been my style. 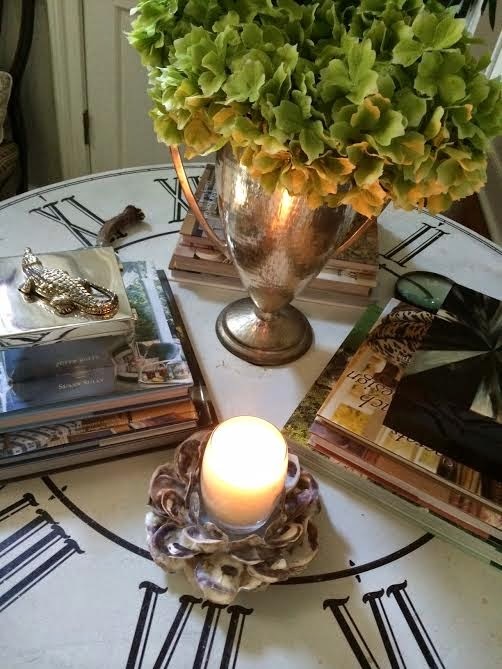 The candle is Low Country Luxe's Spanish Moss. I'd also like to announce the winners of the Uptown Acorn insulated tumbler give away. Congrats to Ann & Liz! 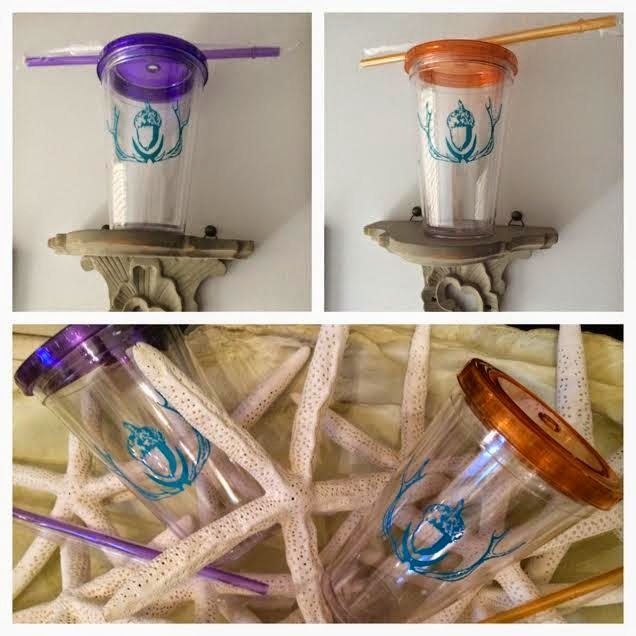 Send me your mailing address, and the tumblers will be on their way today. 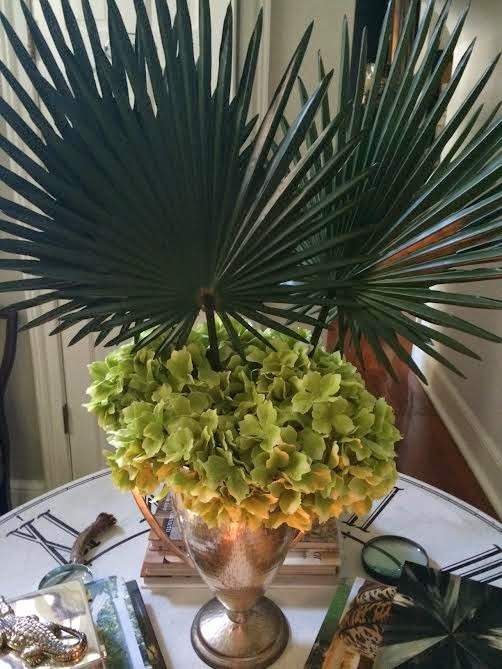 Hydrangeas & palmetto leaves, y'all! I like that floral arrangement and how you have the table arranged- you have such a talent for these things! Yay on my win! Thank you so much- I look forward to receiving it! The entire area is stunning! Very pretty Ron!! I spy another change on the wall too!?! Congrats to Ann and Liz! I love that table. 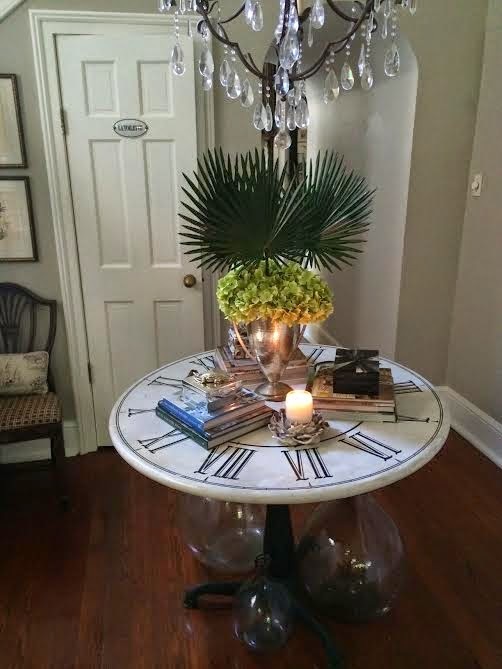 There is just something about a round table in a foyer area. And, the arrangement is beautiful. I love the simplicity of it. And yes, so very southern. Thank you so much!! I love your blog as I do Ron's. As a matter of a fact, I made your Mexican Chopped Salad with fajitas we had last nite. Gorgeous! What a great look for that space! Such a beautiful space!!!! Have a safe and Happy 4th of July!!! What a beautiful display on that round table! 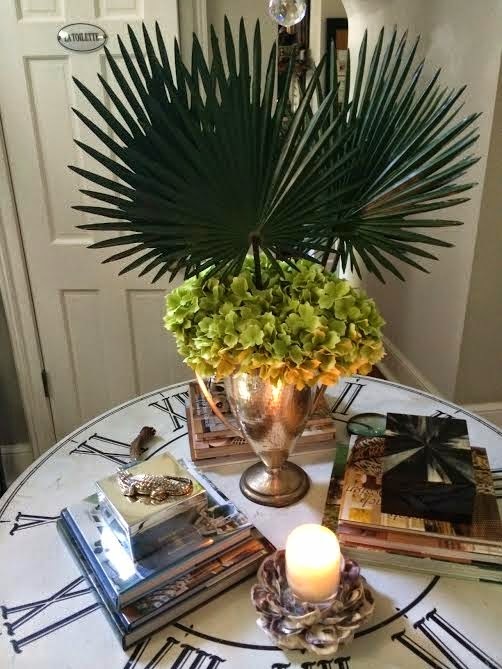 I never would've thought to pair palmetto leaves with hydrangeas but they look wonderful together. I love the story behind them too. Your palmetto fronds are the perfect size. I try to cut some at my parent's house in NW Florida, and they are always huge. The entire table is fab! Ron, Your arrangement is perfection to me! I love fronds, hydrangeas are my favorite and silver is a classic. 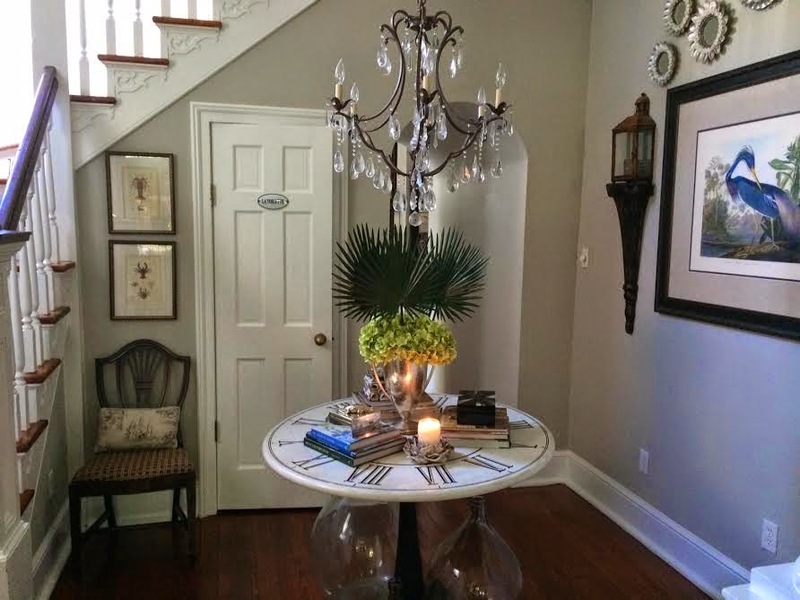 I love everything...the heron and crawfish prints and your chandelier...everything! Is that pillow in your New Orleans toile? Congrats to Ann and Liz! Such a pretty arrangement, Ron. I love that table! Beautiful arrangement, Ron! Gosh, you make everything look so amazing! I would love to smell that candle...I am sure it is wonderful! I can almost smell that delicious candle...your rooms just take my breath away..everything always looks so pretty. 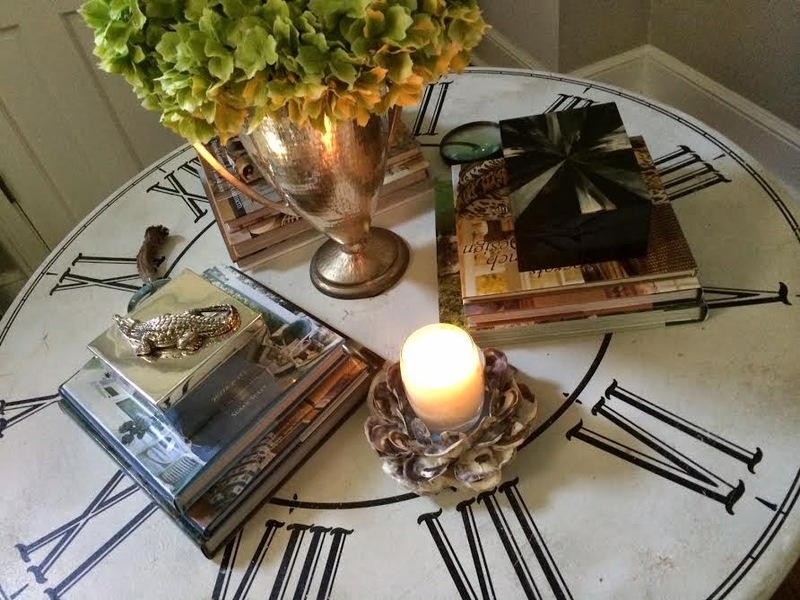 I am totally IN LUV with your clock table. That is such a stunning entry and arrangement! Love that table also. Congrats to the winners!